Our friends over at Case dropped us a line today to tells us that their damascus-bladed SlimLock picked up a Popular Mechanics “Editor’s Choice” award at this year’s National Hardware Show. We’re not surprised: when we spent some quality time with their bone damascus Peanut earlier this year, we were impressed. The Damascus is not only beautiful, it’s also excellent steel, holding an edge longer than you’d imagine. 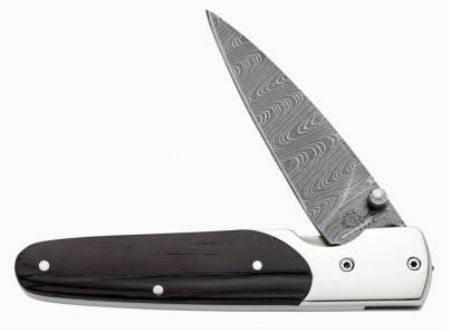 The SlimLock looks awesome, too, with a very basic, practical design that really emphasizes the luxury of the damascus. The one pictured features an ebony wood handle (our favorite), but other exotics are available as well, including snakewood, smooth abalone, bone stag, and presentation-grade mother-of-pearl. It ships with a leather sheath. The design is easy to open single-handedly, and the blade locks into place. And it’s a drop point, which we’ve found is easily the most useful blade for daily use. All in all, this looks like a beautiful and very practical knife — and worth a look. Street pricing starts around $200, varying up to around $300 depending on handle material. Update: We’ve been having some trouble with the direct link below, but Case assures us they’re working it out. In the meantime, it’s easy to find this knife on their site yourself. Just go to http://www.wrcase.com, enter “damascus slimlock” into the search box at the top right, and click on the second link the site returns. Sorry for the inconvenience! Update 2: Case gave us a new link and we installed it below. It should work now. Something about Damascus steel (check out an old lever action damascus-barreled cowboy rifle sometime – talk about goosebumps) ust is so beautiful. No useful info in this comment, just a sweet blade. So, are these beautiful knives in the “Submit a tool, win a tool” giveaways? If so, I need to start looking around my garage for my favorite stuff again. Very nice, and as stated above, there is something about Damascus steel. $200? Out of my price range unless the big number comes up tonight.